We’re always looking for new mobile insights to help advertisers better understand the mobile environment, build their brands and grow their businesses on this platform. Today, we’re announcing that we’re teaming up with Digitas, an integrated brand agency, to deliver original mobile marketing insights and usage research. The initiative will combine original Google and Digitas search and marketing data to forecast trends, inform investment strategies, and drive the creation of mobile optimized websites. Below is the the first of many outputs from this collaboration -- specific insights from Mother’s Day 2011. On Mother's Day 2011 (May 9th), 33% of Google search queries on the term “flowers” came from mobile devices. 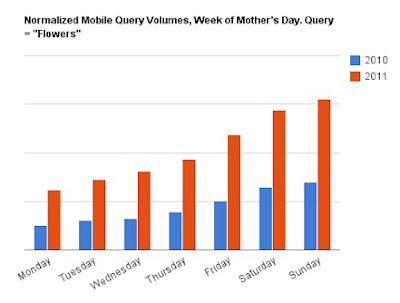 Mobile search queries for "flowers" both on Mother’s Day 2011 and in the week leading up to the holiday increased by over 100% compared with the same periods last year. In the week prior to Mother’s Day desktop searches for “flowers” increased from Monday to Friday, then declined on the weekend, while mobile queries steadily increased all week and maxed out on the weekend. While this is in line with general mobile/desktop usage trends, on the weekend of Mother’s Day, the increase in mobile searches on “flowers” was much higher that usual, as last minute shoppers scrambled to find a bouquet for mom. Google searches on “mother’s day gifts” were relatively consistent across mobile and desktop suggesting that perhaps flowers were the last minute purchase of choice for many Mother’s Day shoppers. Relative to last year, Mother’s day shoppers looking for flowers relied more heavily on mobile. Over the course of the year, our collaboration with Digitas will look at a range of mobile trends to better understand how the advancement of mobile technology and smartphone adoption impacts consumer behavior. We look forward to sharing them with you.